Lotus Preservita Advanced Skin Radiance Facial Kit - Re-hydrate the skin & restores balance to lackluster skin. Removes dark patches & blotchiness caused by sun damage. 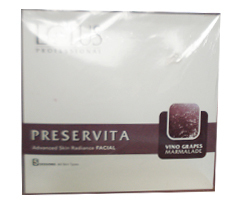 Lotus Herbals - Preservita Advanced Skin Radiance Facial - Vino Grapes Marmalade - 5 Sessions/ All Skin Types. Removes dark patches and blotchiness. Preservita Advanced Fruit Marmalade is a complex mixture made from fruit that has been produced using a revolutionary process that preserves the highly concentrated fruit with all its pure nutrients, enzymes and vitamins for optimum skin benefits. Step 1 : Cleanse the skin with damp cotton to remove superficial dust, dirt and pollution. Apply Preservita Marmalade all over the face and massage for 2-3 minutes to cleanse away all impurities, remove and lifts make-up and pore-clogging residue without making the skin feel drying and non-irritating. Step2 : Mix 3 scoop of Marmalade to Perservita Polisher and apply on the face to exfoliate the dead cell of the skin. Step3 : Spray Preservita Toner all over the face to remove the last trace of dust, dirt, residue and balance the pH level immediately. Step4 : Mix 3 Scoop of Marmalade in Perservita Massage cream and massage for minimum 7 min. to maximum 12 minutes. Step5 : Mix Preservita Masque with Marmalade and apply thick layer on the face. Keep it for 15-20 mins. And remove it. Step6 : Apply Rejuvina Herbcomplex Daily Protection Lotion to protect these new cells from UV. Preservita Toner - Removes the residues, Ph balancing and refines the pores. Preservita Polisher - Walnut Shell Powder - Gently not only exfoliates the dead cells but also polishes the skin. Preservita Massage Cream - Helps regaining a healthy glow and uniquely enhanced radiance. Preservita Masque - Re-hydrate, moisturize, smoothens and revitalize the skin. Preservita Vino Grapes Marmalade - Red Grapes Pulp - Re-hydrate the skin and restores balance to lackluster skin. Removes dark patches and blotchiness caused by sun damage, should give polished texture and rewened vibrancy.